Oak trees are one of the most sought-after varieties of tree, for their beauty and gorgeous display of colored leaves in the fall. The trees also drop thousands of acorns every year. Acorns are not typically eaten or used in cooking, so people are not often aware that they have any use at all. But there are many purposes that the acorns can serve. 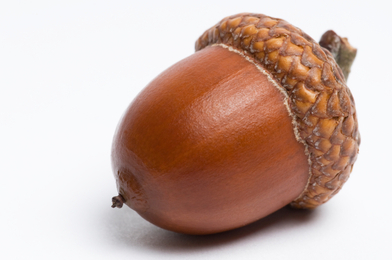 First, acorns are seeds. Their purpose is to grow more oak trees--and with the right care, they can do just that. 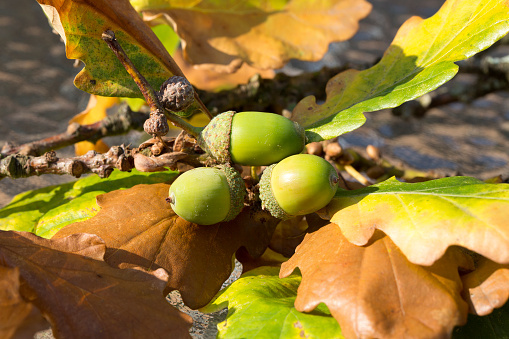 The first step to developing an oak tree is to soak the acorns in water for 24 hours. Then discard the floaters or the little caps. Let the acorns dry; next, place them in a sealable container with a damp paper towel. Refrigerate for 3-4 months, throwing away any acorns that get moldy. After this time, you can remove the acorns from their container and plant them in pots, burying them two inches deep. To protect them from squirrels and other animals, wrap acorns in a bit of chicken wire pointing upward. Now, all you have to do is water the sprouting seedlings and wait until they get tall enough to plant, with hardware cloth to protect them. And watch as your acorns become beautiful trees! Another use for acorns is to provide a food source to wildlife. For many animals, acorns are an essential food source, including chipmunks, rabbits, deer, and, of course, squirrels. The type of acorn matters, however. Acorns from both white and red oak trees produce acorns with nutritional value to animals, but those from white oaks are less bitter and more easily digested. Deer are graceful animals many people enjoy; during the winter, acorns comprise the majority of the deer’s diet. Additionally, in years of better acorn production, deer give birth to twin fauns more often. By leaving acorns on the ground, you can support many of the beautiful animals who gain nutrition from them. Finally, acorns can be used in crafts. For a charming necklace, insert a metal jump ring through the cap right below the stem, apply a sealant such as clear nail polish to the acorn, and wear on a chain. Find an autumny scented candle and place it in a glass jar with acorns around it. Paint the caps of acorns red with white spots to make adorable toadstool decorations, or paint the caps black and the bodies orange, and use a black sharpie to add pumpkin faces for Halloween party decorations. Remove caps from acorns, fill them with melted wax with a wick, light and float them in jars of water for whimsical candle decorations. Sprinkling acorns around table centerpieces can also be beautiful for a fall wedding. This is only a small sampling of the many ways acorns can be used, but with these tips, you can start to enjoy the thousands of little acorns that pepper the ground every single year!